Non-smoker, One Owner, Local, Low Mileage, Leather Seats, Heated Front Seats, Dual Power Seats, Keyless Start! The all new 2018 Toyota Camry has taken itself to a whole new level. 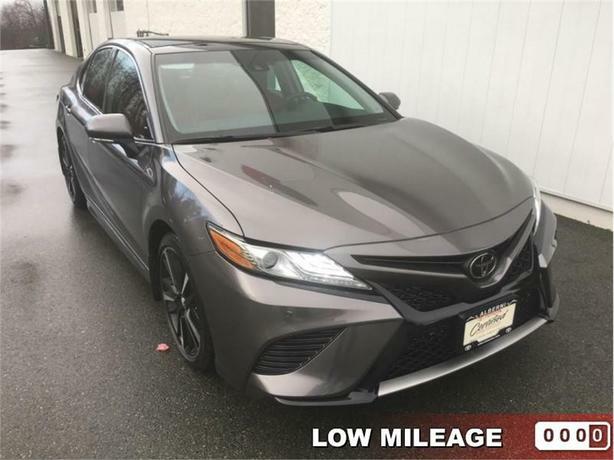 This 2018 Toyota Camry is for sale today in Port Alberni. The brand new 2018 Toyota Camry offers brand new styling, new technologically advanced features and more safety features than you would expect. Responsive and refined, the driving experience is at a whole new level from this historical model. The new model has been transformed into something very different with sharper lines and a wider stance offering better stability. Technologically advanced with surprisingly intuitive tech options, the 2018 Toyota Camry has become a truly unique sedan. This low mileage sedan has just 1682 kms. It's pre-dawn grey mica in colour and is major accident free based on the CARFAX Report. It has an automatic transmission and is powered by a 206HP 2.5L 4 Cylinder Engine. This vehicle has been upgraded with the following features: Leather Seats, Heated Front Seats, Dual Power Seats, Keyless Start, Sunroof, Air, Tilt.